Years ago, I remember my mom making homemade Almond Joy candy bars. A quick Google search revealed a multitude of recipes, and since Almond Joy is one of my all-time favorite chocolate bars, I decided to give it a try. 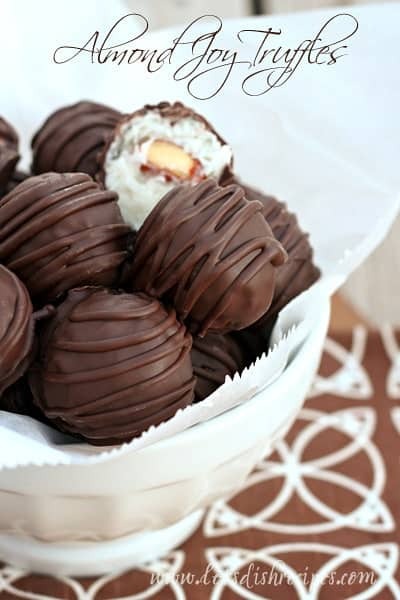 If you’re a fan of Almond Joy, you’re going to love these Almond Joy Truffles. 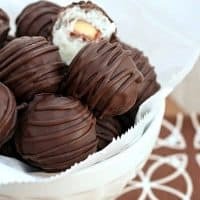 Of course, you could always use this recipe to make a more traditionally shaped Almond Joy, but I decided to go the easy route and just roll everything into a ball. An egg-shaped candy would be perfect for Easter too! But really, it doesn’t matter what shape they’re in, these Almond Joy Truffles are a coconut lovers dream! In a large bowl, combine coconut, powdered sugar, condensed milk, vanilla and salt. Mix thoroughly. Shape coconut mixture into 1-inch balls, pressing a whole almond into the center of each ball. Reshape the coconut mixture around the almond. Refrigerate for at least 30 minutes, or until firm. In a microwave safe bowl, melt chocolate at 50% power for 1 minute. Stir and return to microwave for 30 second intervals, until smooth. Dip the coconut balls into the melted chocolate and place on a wax paper lined baking sheet to set. Drizzle with additional chocolate, if desired. You know- it’s really a shame we don’t live closer. 🙂 I would devour these in record time!! These look so wonderful, Danelle. I love the idea of drizzling more icing over top of the dipped truffles. Yum. This candy turned out to be a sticky mess. I was unable to form balls. I spooned them out into a pan pressed the nut into a small patty as best I could. I refrigerated them over night. They were messy to coat with chocolate and I ended up spooning the chocolate on top of them. They never firmed up enough to eat by hand. Not sure if I did something wrong but this was a waste of time and money for me. I won’t make them again. You might have tried adding a little powdered sugar til you got the right consistency. That usually helps. Just sprinkle over and add a little at a time. I made these for Christmas ! They turned out fabulous. Everyone loves them. I made them a bit too big though. Next time I’ll do more bite size !! When you say 5 cups of coconut, does that mean 8 ounces in a cup or take a measuring cup and get 5? I take a measuring cup and measure 5. I made 1/2 a batch because I was unsure how sweet this would be using condensed milk. It is pretty sweet. After chilling the mixture, I would recommend making the balls and then freezing them for 10 minutes as they became sticky at room temperature and fell apart in the melted chocolate. I made these last night and they came out fabulous. I did make one change though – I used unsweetened coconut flakes. They still taste incredibly sweet. I also used Guittard milk chocolate which really makes a difference because it’s quality it the best.